Johnson & Daviss: Letter C under section III of the list of studies that the Midwives Alliance of North America deems the very best in proving home birth safety is titled, “Outcomes of planned home birth with certified professional midwives.” Published in the British Medical Journal by Johnson and Daviss in 2005, this study promises to finally demonstrate what U.S. direct-entry midwives really provide. The planned home birth outcomes included much lower rates of epidural, episiotomy, and assisted delivery, and cesarean section. None of the mothers in the study died. The perinatal death rate was reported at 1.7 in 1000. This number seems high. Just a few studies ago in Canada, the home birth perinatal death rate was .35 in 1000 (Janssen 2009). 1.7 in 1000 is over four times higher. Yet, the study abstract says that this number is “in line” with other established perinatal death rates. Is that true? The CDC provides the public with access to linked birth and death records for infants as part of a database project called WONDER (Wide-ranging Online Data for Epidemiologic Research). A major limitation of this database is that it does not include intrapartum deaths, because those babies are not issued birth certificates. Fortunately for me, Johnson and Daviss included a breakdown of how many deaths in their study were intrapartum (5) and how many were neonatal (6), which meant a neonatal death rate of 1.1 per 1000. Using the WONDER database for the year 2000 (the same year Johnson and Daviss collected their data), I plugged in the following variables: all babies who died within 27 days of birth, born in the hospital, who were at least 37 weeks gestation, with a known attendant type (type of doctor or midwife). I did not exclude any risk factors except prematurity, which should always be screened out as high-risk for home birth. The neonatal death rate was 0.99 per 1000. This 0.99/1000 hospital neonatal death rate included women with pregnancy complications that would make them too high-risk for even the most experienced (or foolish) midwife to take on. It included the diabetic, pregnant mothers on illicit drugs, the morbidly obese, the poverty-stricken, and those who received no prenatal care at all. It included practically every mother in the U.S. who made it to full-term and got herself to a hospital, regardless of health, socioeconomic status, or pregnancy complications. It also included lethal congenital anomalies, which were excluded from Johnson and Daviss’ numbers. 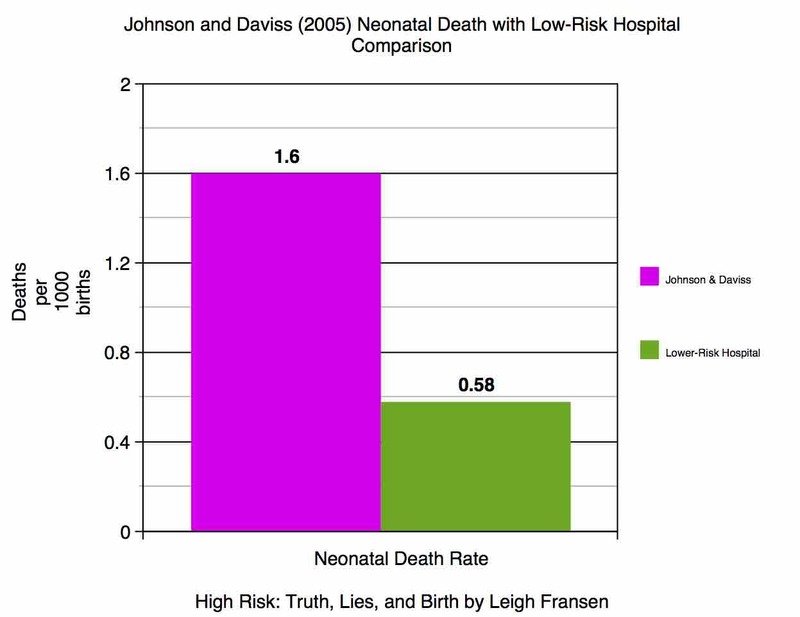 (Including lethal congenital anomalies the Johnson and Daviss neonatal death rate was 1.6/1000.) 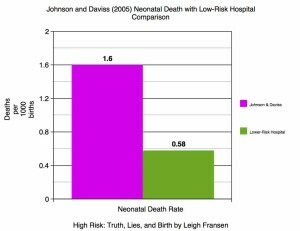 The neonatal death rate including the depth and breadth of risk at hospital births was lower than the self-selected, “low-risk,” health-conscious group who tends to choose home birth that Johnson and Daviss studied. Women who choose nonhospital birth are not a random sample of the overall birthing population; they are self-selected, and (supposedly) carefully screened by their midwives to ensure they are “low risk.” The overall mortality rate for all-risk term pregnancies across the board ought to be significantly higher than the mortality rate for the “low-risk” women who decide on nonhospital birth. It seems as if women are trading their low-risk status in for a nonhospital birth, and thereby actually becoming higher in risk than the general population. If nonhospital birth were just as safe for low-risk women, it ought to be beating all-risk hospital birth hands-down in every aspect of safety. If nonhospital birth isn’t showing a clear lead, we have a problem. I also plugged some variables into WONDER to try to approximate the year 2000 hospital neonatal death rate for low-risk women specifically. I tried to match Johnson and Daviss as specifically as possible by adding in the additional variables of singleton (not twins or other multiples) and looking at Certified Nurse Midwives, who tend to care for lower-risk mothers than obstetricians. Their neonatal mortality rate was 0.58, less than half Johnson and Daviss’ rate, both groups including congenital anomalies. Some may argue that CNMs’ death rates are lowered by the fact that their more complicated cases get referred to obstetricians; that is true. But direct-entry midwives ought to be referring their more complicated cases to obstetricians as well, enjoying the very same benefit. Obstetricians take on all other providers’ most complicated cases, at every stage of complication, and they still maintain a lower death rate than Johnson and Daviss demonstrated. Intrapartum refers to the time during the labor and birth process. Intrapartum deaths occur before the birth of the baby.